Cattaneo Commercial are pleased to announce the successful letting of the town centre restaurant at 20 Eden Street on a new lease. 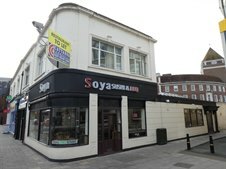 We received very strong interest from a number of operators who are keen to take premises in Kingston but face a lack of suitable properties. Therefore, if you have a restaurant or retail unit that you need to let, please contact either Adam Soliman or David Keates on 020 8546 2166.